Cottonwood Canyon State Park, may be newest state park but it is already the second largest in Oregon. 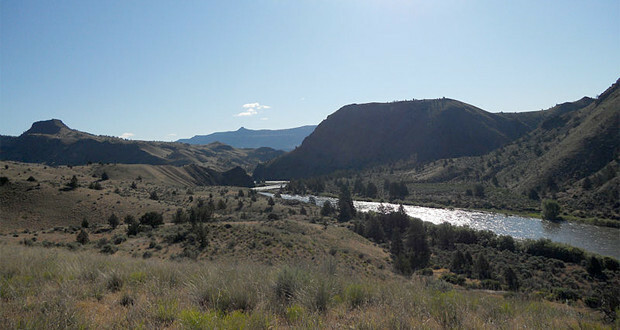 The 8,000 plus acre Cottonwood Canyon State Park is situated along the John Day River and has the potential to become Oregon’s largest state park. Oregon State Parks has applied to the Bureau of Land Management to obtain another 10,100 acres adjacent to the current park. It is thought that the Bureau of Land Management will review the application next year, with the finalization of the acquisition taking place about a year after that. Lying between Wasco in Sherman County and Condon in Gilliam County, Cottonwood State Park is less than 3 hours from Bend. Unlike most of Oregon’s state parks, Cottonwood features an eight-mile stretch of the river flanked by large, rocky cliffs. It is has a much more rugged feel and contrasts the well groomed parks that are throughout most of Oregon. As of right now Cottonwood State Park has camping sites along the river and about 12 miles of trails. So far park amenities are focused near where Oregon Highway 206, which links Wasco and Condon, crosses the John Day River. There is a 21-site car campground, a group tent camp for up to 25 people and a camp for hikers and cyclists with seven sites. The camps have running water and vault toilets. If the vision for the park is met it will feature more than 40 miles worth of trails and some hike-in camping sites. By 2015 the state park would also like to have cabins for rent. The park will also be open to hunting during open seasons and features elk, deer and upland birds. This is a great investment for the Oregon State Parks and will be another beautiful outdoor recreation outlet for the residents of Oregon.